Goat meat lends itself to simple oven cooking, including dry techniques such as roasting. You can also braise meat that is less than tender or broil thinner cuts such as steaks or chops. Goat meat is enjoyed by diners in the United States and around the world. Although meat from a mature animal can be tough if not prepared properly, meat from a young goat is mouthwateringly mild, tender and juicy, with a flavor similar to venison or beef. Trim visible fat from a tender cut such as a shank or leg, then brush the meat lightly on both sides with cooking oil to keep it moist. Add vegetables such as potato wedges, turnips, small onions or sliced carrots, if desired. Place the meat on a rack in a roaster or baking dish, then sprinkle the goat with salt and pepper and herbs and spices, such as thyme, sage or paprika, if desired. Alternatively, you can marinate goat meat with a simple solution consisting of vinegar, oil and seasonings before roasting. Marinate the meat in the refrigerator for up to 14 hours. Place the pan in an oven preheated to 325 degrees Fahrenheit and cook the goat until it reaches the desired level of doneness. A leg roast requires approximately 20 to 30 minutes per pound, while a shank takes about 45 minutes per pound. Watch the meat carefully to prevent overcooking. Allow the meat to stand for at least 5 minutes before serving. Rub a roast with cooking oil, then sprinkle it with salt and pepper to suit your preference. Although you can braise any cut of goat, the technique works especially well for roasts cut from muscular areas such as the shoulder or rump. 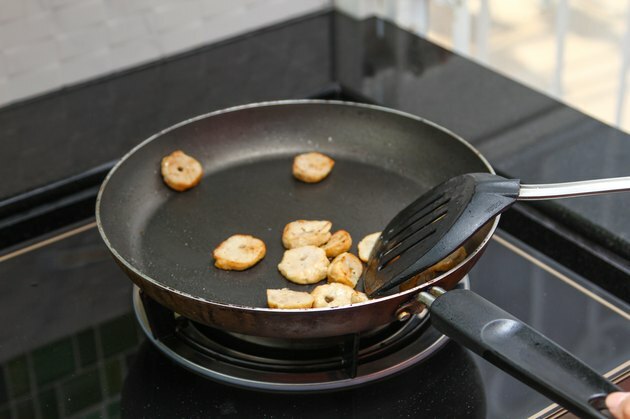 Cover the bottom of a heavy skillet with cooking oil. Put the skillet on a burner turned to medium-high, then brown the meat, turning it with tongs, until both sides are golden brown. If you like, you can fry chopped onion and garlic in the same pan. Transfer the meat to a roasting pan or Dutch oven. Pour in beef stock and add canned, diced tomatoes, if desired. You can also use liquids such as beer, wine or apple juice. Use enough liquid to bring the level to about half the height of the meat. You can cover the meat entirely if you want stewed goat meat. Cover the pan tightly and cook the meat at 325 F until it is fork tender. Alternatively, you can place the pan on the stove top and let the liquid simmer gently on low or medium-low. Cooking times depends on the size of the meat, but most roasts require at least 2 hours. Check the meat often and add more liquid to replace any liquid that evaporates. Preheat the oven broiler and place the oven rack 4 to 5 inches below the heat. Slit the fat on the edges of thin cuts of meat such as steaks, filets or chops. Make the cuts at 1-inch intervals to keep the meat from curling under the broiler. Don't penetrate the meat with the knife; puncturing the meat causes loss of meat juices. Rub the meat on both sides with cooking oil. If you like, rub both sides with a garlic clove. Coat the broiler pan with oil or nonstick cooking spray, then place the meat on the pan. Sprinkle the meat with salt and pepper, if desired. Broil the meat, turning it once, until it reaches the desired level of doneness. A medium-rare chop, steak or fillet with a thickness of approximately 1 inch takes about 5 minutes on each side. Add an extra minute on each side for meat cooked to medium. Use a meat thermometer to ensure that your goat meat is cooked to a safe temperature. The meat is medium-rare when the thermometer registers 145 F. If you prefer your meat cooked to a medium level of doneness, cook it to 160 F. Meat below 145 F may not be safe to eat.